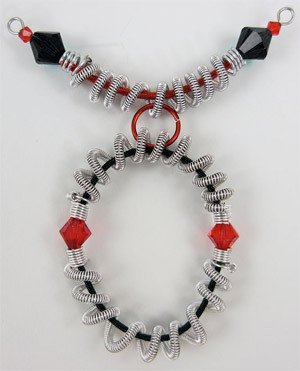 Create a chain of connecting links made with sturdy Beadalon® stainless steel wire and colorful Zebra Wire™. Add Swarovski crystal in light Siam, crystal rose gold and jet hematite 2X to warm the cool industrial look of stainless steel. In this design, the updated Deluxe Coiling Gizmo® Econo Winder is used to form all of the coils for each link. This tool makes nice neat coils as well as winds the 3/4 hard tempered wire more easily than if you formed the coils by hand. And even though the soft-tempered Zebra Wire could be coiled by hand, the Coiling Gizmo will make similarly tight coils in each of these very different types of wire. Following manufacturer's instructions set up the Coiling Gizmo with the thinnest (1mm diameter) crank rod in place. Using 26-gauge black Zebra Wire, uncut and directly from the spool or bundle, make six 4-inch coils and one 3-inch coil on the Coiling Gizmo. Using heavier duty cutters or memory wire shears, cut six 6-inch lengths and one 5-inch length of 22-gauge stainless steel wire. Using one 6-inch length of wire, thread on a Swarovski crystal rose gold 4mm round bead, a 4-inch black coil from Step 1 and a Swarovski crystal rose gold 4mm round bead. Use looping pliers or heavy-duty round-nose pliers to form simple loops on each end to create a "twist tie." Repeat to create 6 then set them aside. Using the 5-inch length of 22-gauge stainless steel wire, thread on a Swarovski light Siam 6mm bicone bead, a Swarovski crystal rose gold 4mm round bead, a 3-inch coil from Step 1, a Swarovski crystal rose gold 4mm round bead and a Swarovski light Siam 6mm bicone bead. Form simple loops on each end to form a twist tie then set it aside. Repeat Step 1 to form two 2-1/2 inch 26-gauge black Zebra Wire coils and one 2-1/2 inch 26-gauge red Zebra Wire coil. 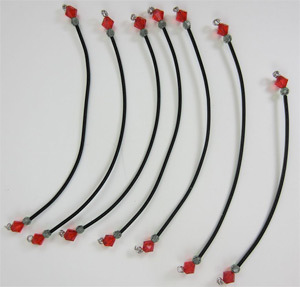 Set these coils aside for use in the center bar and the dangle link. Set all coils aside in groups according to length. Stainless steel 22-gauge wire is used as a core wire to transform simple coils into complex coils. Tip: The required length of core wire needed will differ depending on the length of the simple coil. Work the core wire (22 gauge) uncut from its bundle. 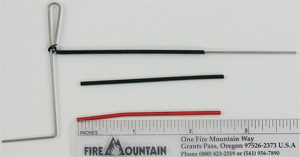 You will likely use from 1 to 2 feet for each core wire needed to form the complex coils. Set up the Coiling Gizmo with the third thinnest crank rod (3.2mm). Place one 3-inch simple coil from Step 4 onto the 22-gauge wire. Anchor the 22-gauge wire onto the crank rod and turn the rod until the simple coil is completely wound around the core wire and so you form just a few coils from the 22-gauge wire on the end. Repeat three times to complete four small complex coil links. Set aside. Repeat to create four mid-size complex coils using the 4-inch simple coils. Repeat to create four large complex coils using the 5-inch simple coils. Cut a 6-inch length of 26-gauge stainless steel wire. 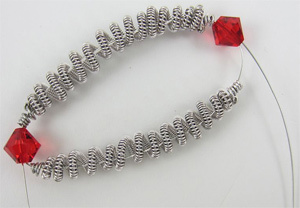 Add a Swarovski light Siam 6mm bicone bead then one small complex coil made in Step 5. Add a second Swarovski light Siam 6mm bicone bead and a second small complex coil. 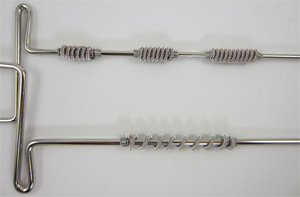 Continuing with the same wire end, pass it through the first bicone bead and complex coil strung so the end exits the second bicone bead and the coils are formed into somewhat of a closed circle. 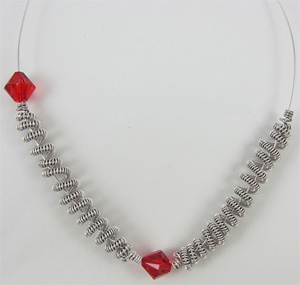 Tighten up the 26-gauge wire and hand form curves in the complex coils to shape into an oval link. Make certain all 26-gauge wire is tightened then wrap the wires several times next to the bicone bead. Trim the wire ends after the wire has been secured. Tip: If there is any trouble laying down the wrapping wire, make an overhand knot to secure the placement for the first wrap, then make several wraps and trim the wire ends. Repeat Step 6 using 6 inches of 26-gauge wire, two midsize complex coils and two Swarovski light Siam 8mm bicone beads to form a midsize link. Create two. Repeat Step 6 using 6 inches of 26-gauge wire, two large complex coils and two Swarovski light Siam 8mm bicone beads to form a large link. Create two. There should now be a total of six finished, graduated links to form the necklace and three complex coils left over. 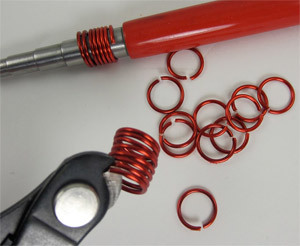 Using 16-gauge red Zebra Wire, form a coil on the largest barrel (9mm) of a jumpring mandrel. Remove the coil from the mandrel and cut into the coil with memory wire shears to create flush cut jumprings. Set four flush-cut jumprings aside. Pull and elongate one of the three extra-large complex coils made in Step 5. Repeat for the remaining two. 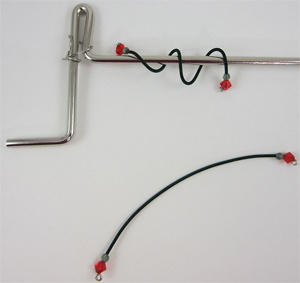 Insert the 2-1/2 inch red simple coil made in Step 3 through the length of an elongated coil. Cut a 4-inch length of 22-gauge stainless steel wire. Insert the wire into the red simple coil in the center of the complex coil from Step 8. Thread onto one end, a Swarovski jet hematite 2X 10mm bicone bead then a Swarovski light Siam 4mm bicone bead. Make a simple loop after the beads to hold them in place. 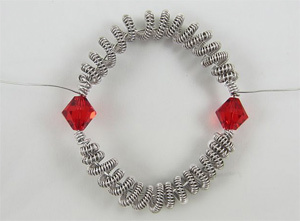 If needed, trim the red coil so you have enough stainless steel wire left to hold two beads and form a simple loop on the other end. Repeat adding the beads and forming the loop. Set aside. Repeat Step 6, assembling the two remaining elongated complex coils, the remaining two 2-1/2 inch black coils from Step 3 and two Swarovski light Siam 8mm bicone beads. Attach one 9mm jumpring from Step 7 to the center of the center bar from Step 8 and connect it to the top center of the dangle link. All of the formed parts are now ready to be assembled with the twist ties made in Step 2. Wrap a long twist tie loosely around the thickest crank rod. Beginning on one side of the necklace, connect the smallest link to the midsize link with the loosely formed twist tie. Tighten until the two links are connected but not taut. Repeat connecting the midsize link to the largest link. 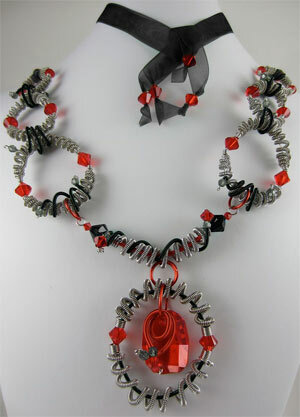 Attach a twist tie to the lower part of the largest link in a decorative twist. 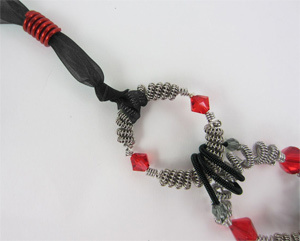 Open one 9mm red jumpring and attach it to the lower part of the largest link in between the twist tie wrap. Attach the same jumpring to the simple loop on one end of the center bar. Close the jumpring securely. Repeat Step 11 to form the other side of the necklace. Wind the remaining twist tie around the center bar as a colorful embellishment. Open a red 9mm jumpring then thread it through a light Siam graphic pendant and through the middle of the topside of the dangle link. Close the jumpring securely. Form a coil of 16-gauge Zebra Wire made on either of the two thickest crank rods (4.0 or 4.75mm). Trim to a 6-ring coil. Tip: The choice of either the 4.0 or 4.75mm crank rod depends on the width (thickness) of the ribbon that the coil will be covering. Repeat to form a second coil. Cut a 36-inch length of ribbon. Thread it through the smallest link and create an overhand knot; tighten the knot toward the link. Thread the 6-ring red coil over the ribbon ends then position it over the ribbon knot. Use a pair of chain-nose pliers to flatten the top and bottom rings of the coil against the knot to secure it in place. Repeat for the other side of the necklace. Trim the ribbon ends to the desired length and so a bow can be formed. 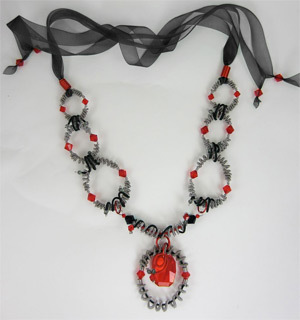 Cut each of the four ribbon ends on a steep angle, thread onto each end an Swarovski light Siam 8mm bicone bead. Trim the ends to less of an angle and apply a clear fabric adhesive to prevent fraying. 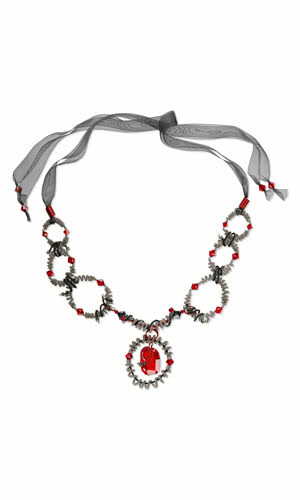 Set aside to dry thoroughly before wearing the necklace. 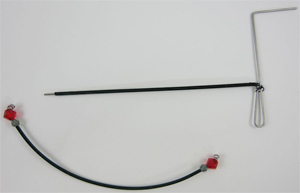 Form a 3-inch coil of red 26-gauge Zebra wire on the 1.6mm crank rod. Repeat Step 2 using 22-gauge stainless steel wire, Swarovski light Siam 6mm bicone beads and Swarovski crystal rose gold 4mm round beads to form a twist tie. 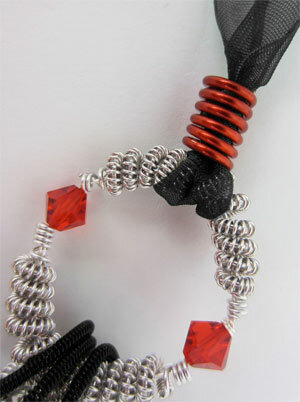 Form a loose coil with this twist tie and add it to the 9mm jumpring that joins the pendant to the dangle link.